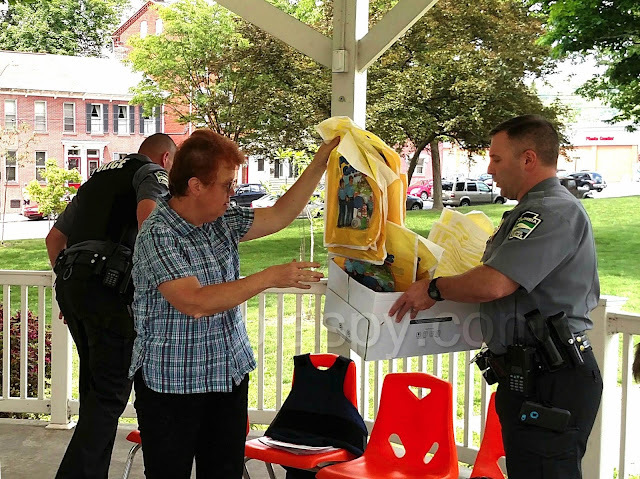 Students from Our Lady of the Angels gathered in the Gazebo at Locust Street Park on Thursday afternoon. They were there to meet the police. 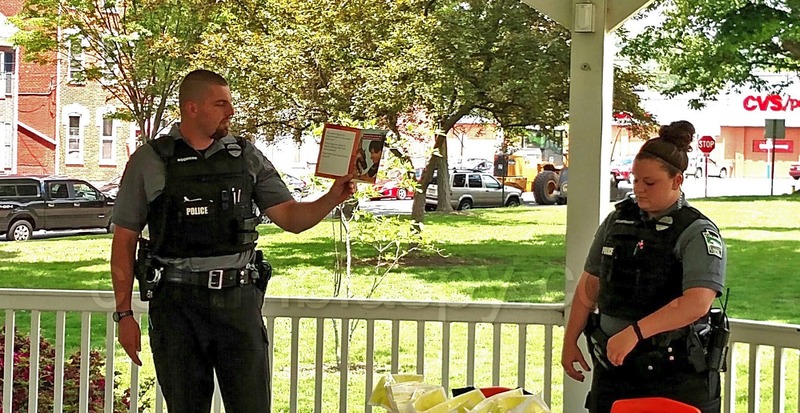 As part of National Police Week (May15-21), Chief Jack Brommer - with Officers David Souders and Amy Kuhrmann - spoke to the group about their role in keeping the community safe. Officer Souders opened by reading a book titled Police Officers on the Go. What education is necessary to become an officer? Some have college degrees and all go through special training which includes physical challenges and testing. What types of calls do officers respond to? Traffic violations, fights, thefts, domestic disputes, and others. What kind of gun is carried? A 40-caliber Glock. What tool is used the most? Officer Souders held up his pen. He explained that the job involves writing reports and taking notes. Officer Kuhrmann said that handcuffs can be an excellent tool, too. Officers showed equipment carried on their belts: Taser, baton, pepper spray, gun, and extra bullets. 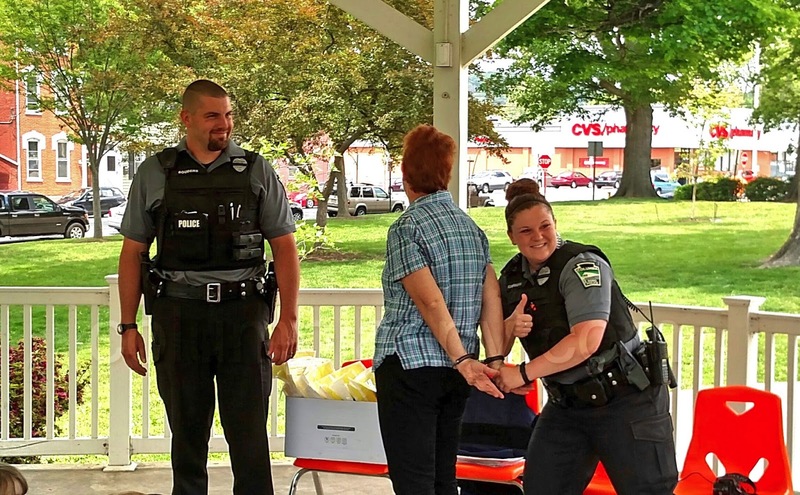 Library administrator Lisa Greybill entertained the children by offering to be handcuffed. Chief Brommer uncuffed her a few minutes later. The handcuffs and a bulletproof vest were passed around for inspection by the audience. The best was saved for last when other officers arrived, and two police vehicles parked nearby, giving the children a firsthand look. They were excited to examine cars and equipment. Sirens wailed as the demonstration came to an end. 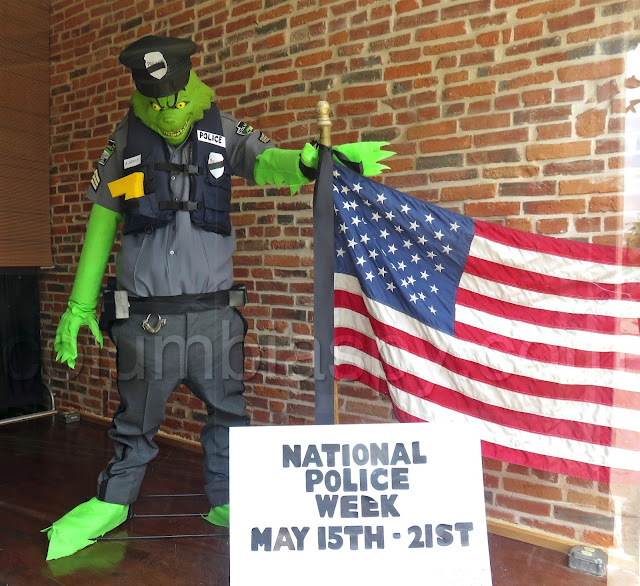 Meanwhile, downtown, Sergeant Grinch was also observing National Police Week at Tacos to Go on Locust Street. Awesome article! Thank you, Sharon, for coming out!